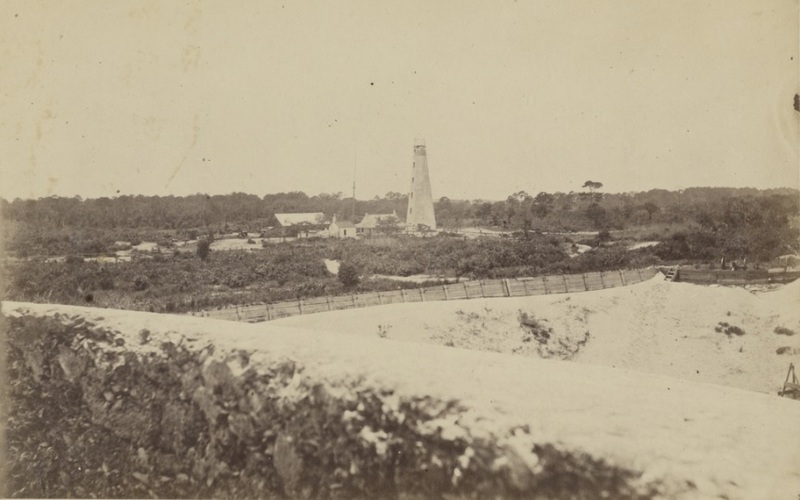 The Confederate troops at Causton’s Bluff had their regimental bands as well, although their music was by no means an enticement to deserters from the enemy. 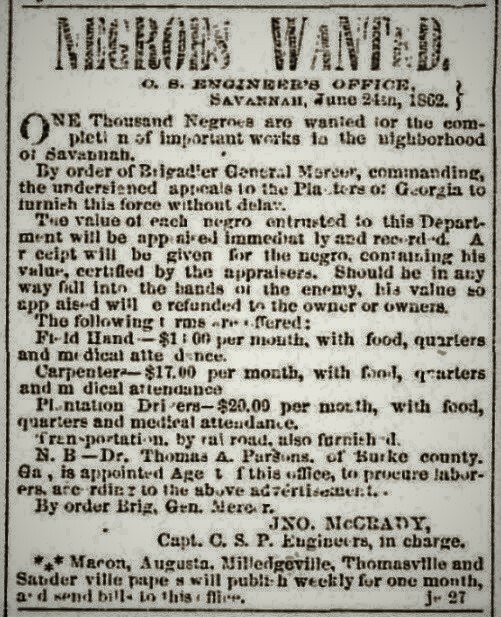 Colonel Marcellus Douglass was advertising for “musicians for the Brass Band of Thirteenth Regiment Georgia Volunteers C. S. A., now stationed at Causton’s Bluff, near Savannah, Georgia. The Instruments vacant are one Bb Bass Tuba, one Bb Trombone, one Bb Tenor, two Bb Altos, and two Eb Altos.” Later, Lacey E. Lastinger, of the Berrien Minute Men, would serve as a drummer and musician for the 29th Georgia Regiment at Causton’s Bluff. 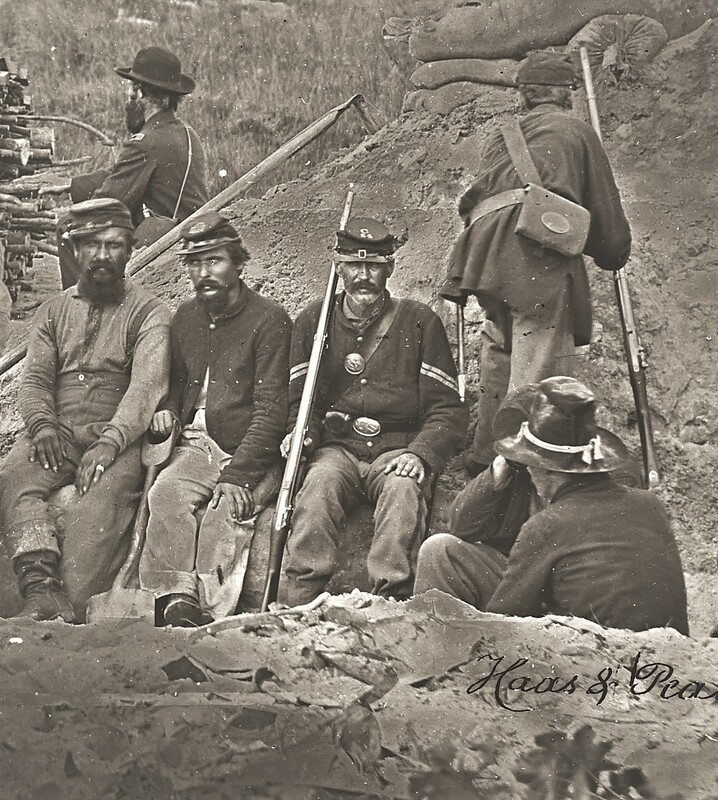 Berrien County, GA sent forth in the Civil War two companies of men known as the Berrien Minute Men. 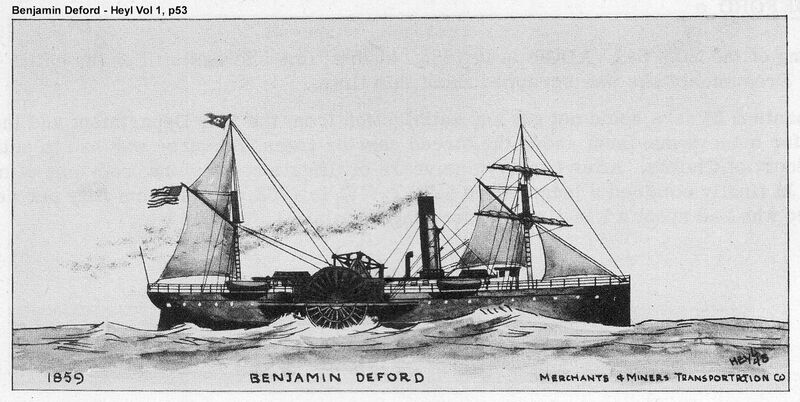 In the early months of the war, the Campfires of the Berrien Minute Men made along the Georgia coast, at Brunswick, Sapelo Island, and Darien, GA. By early 1862 The Berrien Minute Men, having gotten “regulated” into the 29th Georgia Infantry Regiment , were sent to Camp Wilson, near Savannah. Some companies of the 29th Regiment had arrived earlier; Bryant Gainey, of the Alapaha Guards, died of pneumonia at Camp Wilson on Christmas Eve, 1861. Camp Wilson had been established more than a year prior to the arrival of the Berrien Minute Men. Other Regiments encamped there were the 25th Regiment, 27th Regiment, and 31st Regiment. 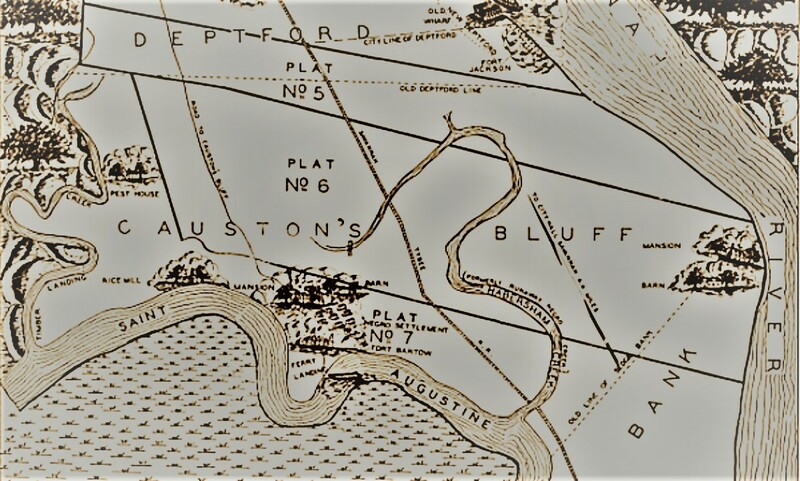 The camp was located two or three miles below Savannah, on White Bluff Road some distance beyond the Atlantic & Georgia Railroad [Atlantic & Gulf?]. 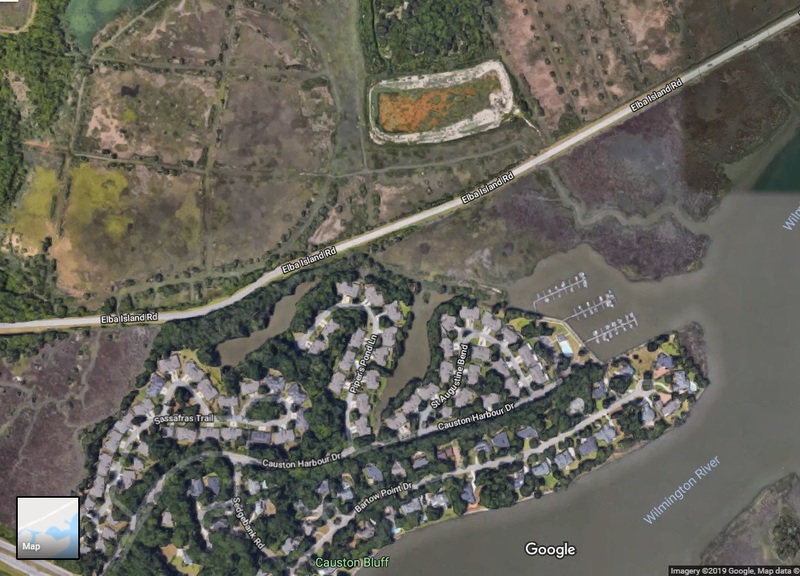 White Bluff Road was the Shell road which was then an extension of Whitaker Street. Camp Wilson was two miles from Camp Lawton and one mile from the soon to be established Camp Tatnall. Isaac Gordon Bradwell, a soldier of the 31st Georgia Regiment, described Camp Wilson as a large, level field. It had room enough for four regiments and their equipment, officers horses, a parade ground, and a place for religious meetings and services. The rations were ample, and consisted of flour, corn meal, and bacon. To these afterwards were added, rice, pickled beef, peas, sugar, coffee, sometimes vegetables, and always hard-tack. This was a kind of cracker prepared for the army sometime previous to the outbreak of the war, and it was as hard as wood. No salt, shortening, soda, or other leven whatever was used in its preparation, and it could be eaten only by those who had good sound teeth; but we found out later that it could be soaked with hot water and grease in an oven and be made quite palatable. In its original state, I suppose it would keep indefinitely in any climate. Each cracker was about six inches in diameter and about an inch thick. When broken with a hatchet, or other instrument, the edges of the fragments were shiny and showed it solid composition. Some soldiers thought the camp provisions were less than satisfactory. Lieutenant Theodorick W. Montfort, of the 25th Georgia Regiment, in a letter from Camp Wilson to his wife wrote on January 14, 1861 : “We have poor beef & fresh shoat meat cost us 18 cts per lb.” Montfort requested food be sent from home, “some back bones, spare-ribs, sausages, butter & eggs…,” assuring his wife that the Confederate government would pay the freight on such shipments. I had the good fortune of coming on two shad which were made mine by paying $1.25. While on my way home through the streets of Savannah, I was teased nearly to death about my fine shad. 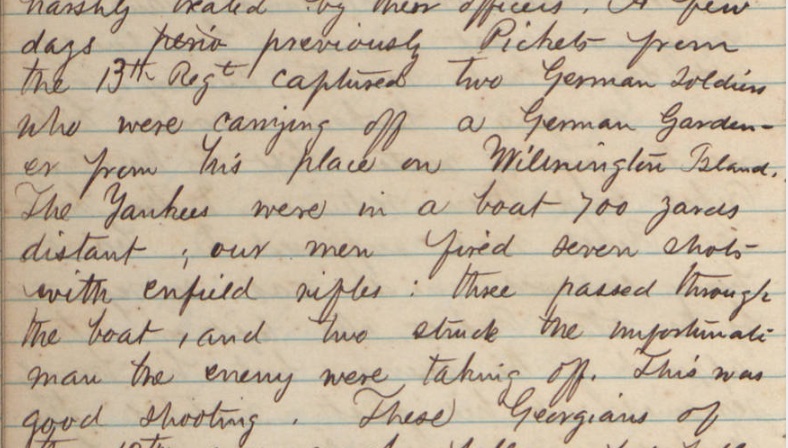 After we had arrived in camps and partaken of supper, I and my friend H_ went to Capt. Hill’s tent and W_ was not there. I went back to the fire, and was trying to think where my friend W_ could be. While I was thus engaged in thinking, I heard a kind of smacking of lips in the direction of a small tent off to the left: I walked up and what a busy crowd! There were my friends who had teased me, busily engaged in completing the destruction of one of my shad. I walked in just time enough to get a nice piece and the last piece of my devoured shad. We laughed it off and each one of us retired to our respective tents. [Continuing the following day,] I arrose this morning at the tap of the drum, and after I had answered my name and washed my face, I partook heartily of my remaining shad, who was now without a mate as the other had been unceremoniously devoured by the devilish mouths of my friends last night. The Federal fleet keeps at a respectful distance, though it is thought that Gen. Sherman will be forced to make a forward movement soon. Ten or twelve of his large war steamers can be seen occasionally, near some of the Islands, but they never stay at one place long at a time. Gen. Lee is in the city to-day. Of course his mission is not generally known. 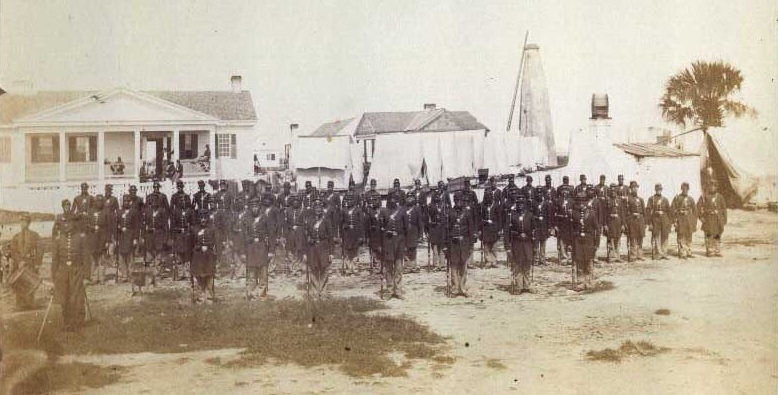 Perhaps Lieutenant Perry was unaware that the Federals had occupied Tybee Island on November 24, 1861 after it was abandoned by the Confederates. 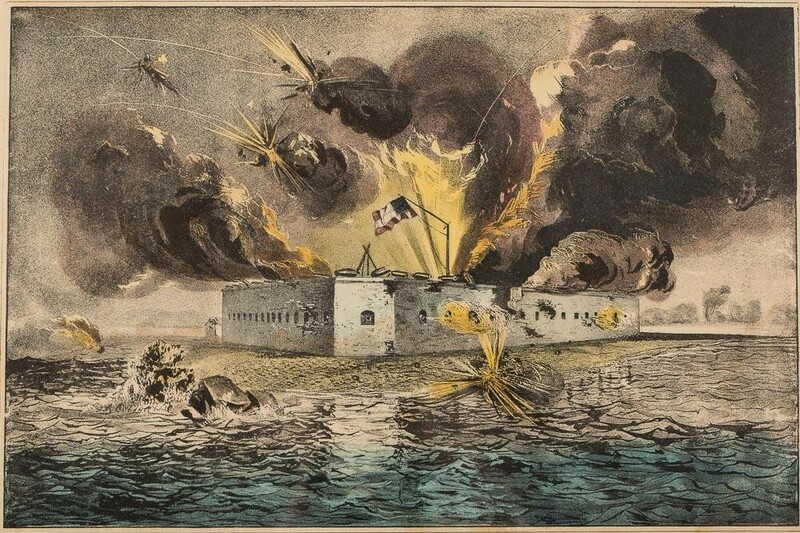 Furthermore, the Federals were busily landing men and materiel’ at the Martello tower on Tybee, and secretly preparing for the siege of Fort Pulaski. 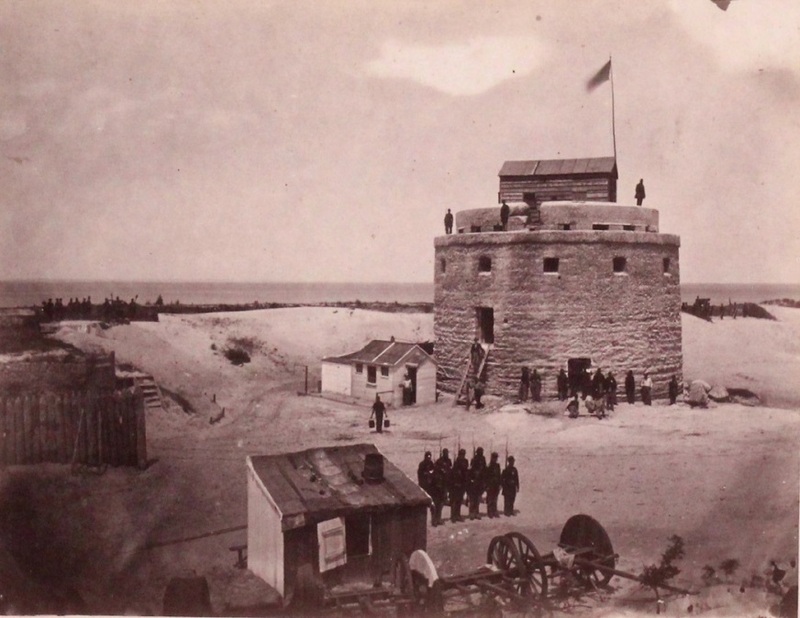 Martello Tower, a relic of the Spanish exploration of America, was the landing place for all Federal supplies brought on to Tybee Island in advance of the siege of Fort Pulaski. …we are…now engaged in throwing up batteries at different points and in cutting down trees on all the roads leading from the coast to Savannah, that is not across them but every tree on each of the road to the swamp – the object of this is to prevent the Yankees from flanking us on either side with their artillery or cavalry, but compell them to keep the road, by this means they can bring but few men into action at any one time and with our Batteries we can sweep the roads – the cause of this unusual excitement is daily increase of the Yankee Fleet on our Coast. 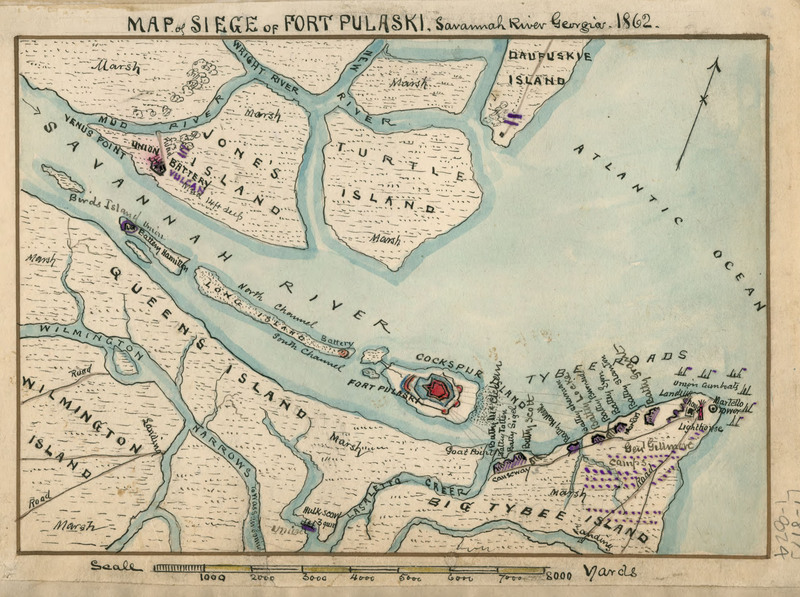 Despite the proximity of the Federal forces, in some ways the familiar routines continued within the line of defenses ringing Savannah. 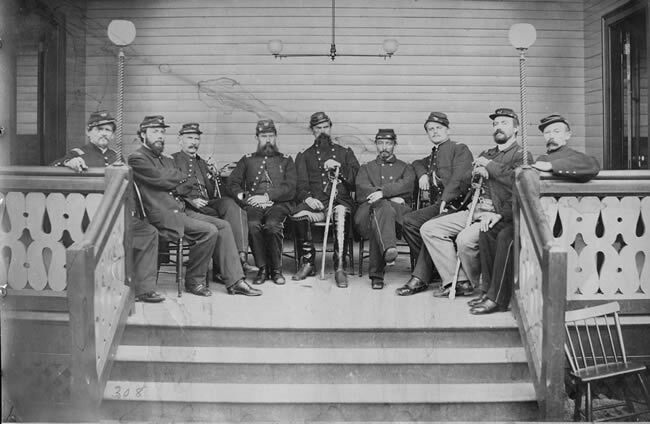 While at Camp Wilson, soldiers of the 29th Georgia Regiment complained that the Savannah post office would not allow the men in service to mail or receive letters until after noon, prioritizing morning mail for the benefit of civilians. Mr. Editor: I desire a place for the benefit of the soldiers and their friends who are here in defence of this city. Why cannot soldiers receive communications through the post office as soon as the citizens here? By order of the postmaster, at 12 M. is as soon as they can receive or transmit any communication through this office, while citizens receive their mail matter by 10 A. M. Besides, we are threatened that upon a requisition to change this order from a colonel of a regiment, 2 P.M. for up-country soldiers will be as soon as the mail will be delivered at office, for no regimental box will be rented, but the mail matter will be thrown into the general delivery. Soldiers that have abandoned the pleasures and comforts of their homes – have borne the fatigues and fortunes of the camp – yea, and of the field, certainly are entitled to equal courtesies with citizens. Further, soldiers DEMAND of civilians equal rights, equal privileges. We are here in Savannah for its defence -for the defence of Georgia – for the maintenance of the Constitution of the Southern Confederacy – for the protection of women and children, property, freedom of opinion, and every thing that freemen hold sacred and dear| For this, though soldiers, yea, privates, are we to be ordered to stand aside, while courtesies are shewn to citizen civilians. We own much, and will pay, occasion offering, to the citizens (especially the women) of Savannah for kindness to our sick brethren in arms; but we have left our loved and dear ones at home, from whom a letter is an angel’s voice against temptations and vices of camp – as sweet, soft music to the anguished soul – as savory ointment to the wounded spirit – and yet, when calling for this the only true solace a soldier has for his labors, he is met with “Wait till 12 M., or you shall not receive your mail matter before 2 P. M.,” an hour that were a man’s wife dying, and wishing to receive her last breathing sigh, ‘twould be too late to get to her death bed, by army regulations properly made at headquarters here. Soldiers will complain, and we think properly. Last Sabbath a week ago, we organized a Sabbath school in our Regiment and appointed the Rev. Mr. Harroll Superintendent, and Thoms. J. Perry Secretary and Libarian. We have built us a Bush Arbor, in the rear of our camps, about 200 yards distant. We have also agreed to hold prayer meeting every Tuesday and Thursday nights, and have preaching every Sabbath at 11 A.M., 3 P.M., and again at night, and have invited the other two Regiments to join us. Quite a number of Col. Phillip’s Regiment have accepted the invitation, and gone to work with a hearty good will. Prof. P. H. Mell preached for us last Sabbath at 11 A. M., and again at 3 P. M., and at night gave us a talk upon the subject of prayer.